When bicyclists and motorists share the road, cyclists face an inherent risk for injuries. According to the Centers for Disease Control and Prevention, in 2013 over 900 bicyclists were killed on roads in the United States. Almost 500,000 people had to visit the emergency room for treatment due to bicycle-related injuries. Our team at Evergreen Personal Injury Counsel would like to ensure all cyclists stay safe on the roads. 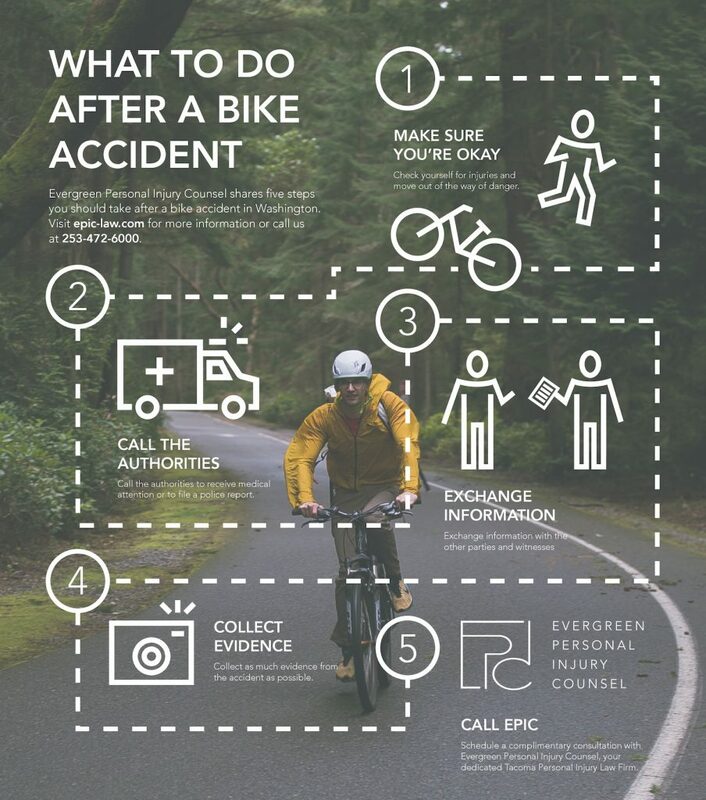 In the event the worst happens, we created a helpful, easy-to-follow infographic to guide you after a bike accident in Washington. Be sure to contact our Tacoma bike attorneys if you have any additional questions regarding Washington bicycle laws or bike-related accidents. We’re here to help.